The AVR-S940H offers Dolby Atmos, DTS:X and DTS Virtual:X, plus the latest video technologies such as Dolby Vision, HDR, HLG and 4K video upscaling. Stream most major popular music services with built-in HEOS and control the AVR with Amazon Alexa voice compatibility. Award-winning Denon Setup Assistant provides a seamless setup experience. The Denon AVR-S940H features Dolby Atmos, DTS:X and DTS Virtual:X, plus the latest video technologies such as Dolby Vision, HDR, HLG and 4K video upscaling. 8 HDMI inputs and 2 outputs features HDCP 2.2 support on all ports. The front-panel USB offers convenient audio playback of MP3, WAV, FLAC, ALAC and DSD (2.8/5.6MHz) files. Stream popular music services like Spotify, Pandora, Tidal and more with built-in HEOS technology, and control the AVR with Amazon Alexa voice compatibility. 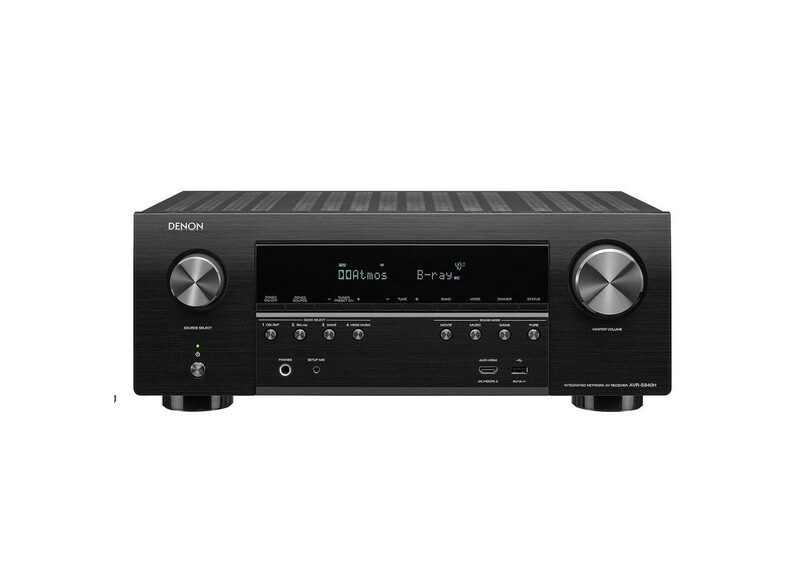 With the award-winning Denon Setup Assistant, the Denon AVR-S940H is just as easy to set up as it is to enjoy. Dolby Atmos, DTS:X and DTS Virtual:X for an immersive, three-dimensional audio experience. Eight HDMI inputs with full HDCP 2.2 Support and Two out gives you the ability to connect up to six of your favorite media devices as well as your TV and other video device with full 4K support such as 4:4:4 color resolution and BT.2020. Amazon Alexa voice control compatibility for hands-free control of your AVR-S940H and wireless music services. Featuring discrete high-current power amplifiers on all channels, the AVR-S940H delivers maximum performance and 185 watts of power per channel (6 Ohm, 1kHz, 1ch driven, 10% THD). With low impedance driver capability, it offers operational stability with a wide range of speakers for balanced, quality sound. Plus, auto Eco Mode adjusts power output to speakers based on volume level and on-screen eco meter, providing power consumption reduction in real-time. SOUND IN THE RIGHT PLACE. Feel every dimension in Dolby Atmos. Dolby Atmos transports you into the story with moving audio that flows all around you with breathtaking realism. Enjoy a 5.2.2 surround sound speaker system including 2 Dolby Atmos elevation speakers for the ultimate home theatre experience - including Dolby Surround upmixer for legacy content. BE CLOSER TO THE ACTION. DTS:X immersive audio places sound where it would occur naturally in space, creating a lifelike, multi-dimensional audio experience in the home. The improved immersion and heightened realism draw you into the world of your favorite movies. The included DTS Neural:X gives your movies, games and music a realism unmatched by traditional 5.1 surround sound. Enjoy your favorite music in any room of your home wirelessly with built-in HEOS technology. Play the same song in every room, or select a different song for each connected room —the choice is yours. Also works with Amazon Alexa providing cutting-edge voice control and incredible sound for all of your home entertainment–or control it all with the free HEOS app. Stream music stored on your home network–connect to HEOS wireless speakers or even other HEOS-enabled receivers and listen throughout the whole house. Enjoy music from TuneIn, Internet Radio, Pandora, Spotify, Amazon Prime Music, iHeartRadio, SiriusXM, Soundcloud, Tidal, Napster or Deezer. SELECT THE PERFECT HEOS FOR YOUR SETUP. HEOS technology within the AVR-S940H allows you to stream your favorite music wirelessly around your home to any other HEOS-enabled device, like HEOS speakers. Ideal for damp environments or outdoors. The perfect choice for medium sized rooms. Bring beautiful sound into larger rooms. Get the party going in wider spaces and open areas. GEARED UP FOR 4K ULTRA HD. BREATH NEW LIFE INTO LEGACY SOURCES. The AVR-S940H features eight HDMI inputs and two outputs —including one input on the front panel —that support full 4K Ultra HD, HDR (High Dynamic Range), BT.2020, Wide Color Gamut and 4:4:4 Pure Color sub-sampling. HDCP 2.2 processing is available on all HDMI ports, and with two HDMI outputs, connecting a TV and projector in parallel is possible. The AVR-S940H supports High Dynamic Range (HDR) video format. It is even ready for Dolby Vision and HLG (Hybrid Log Gamma). Dolby Vision compatibility and HLG (Hybrid Log-Gamma) provide exceptional brightness, contrast and color. HLG offers HDR technology over broadcast content. SET-UP AND CONNECT WITH EASE. The included AVR-S940H Quick Start Guide provides simple, clear instructions for how to get started. Once you connect your TV to the AVR-S940H via HDMI, the exclusive Denon Setup Assistant appears on your TV screen to walk you through setup, step by step. A row of color-coded speaker connections is laid out horizontally, making organizing and connecting speaker wires simple. Control the Denon AVR-S940H with your Smart TV remote via the HDMI CEC functionality associated with your Smart TV. Simply set “HDMI Control” to ON in your receiver, then set “Smart Menu” to ON and begin controlling the AVR-S940H with your TV remote. The Smart Menu home screen provides you quick access to source and surround mode selections, the AVR's setup menu and four Quick Selects. The latest Denon audio/video products use the Audyssey suite of EQ products for simple, accurate set-up and calibration and an “under the hood” view for detailed tuning. With the supplied measuring microphone, Audyssey measures all the speakers in your home theater during setup, and then provides the smoothest most optimal overall listening experience. Audyssey Dynamic Volume and Audyssey Dynamic EQ smooths out annoying jumps in volume (such as TV commercials), letting you listen at lower levels and still enjoy clear dialogue, music and sound effects and precision tonal tailoring for full range clarity at any listening level. The Audyssey MultEQ Editor app lets you view speaker detection results, to check correct installation and the before-and-after results of the Audyssey calibration, making it easy to optimize individual room acoustics. The heart of your wireless network. With Bluetooth and Wi-Fi wireless streaming connectivity, the Denon AVR-S940H is equipped with an advanced dual antenna transceiver system for robust streaming even in congested urban environments. Enjoy listening to your favorite audio content wirelessly from your smart devices. Better control in your back pocket. The Denon AVR Remote app for iOS and Android makes using the AVR-S940H even easier —adjust volume, turn it on or off, mute the music, select a source or switch to HEOS. Download the Denon AVR Remote app to your smartphone today. The Denon AVR-S940H front panel features four Quick Select buttons that store your preferred audio settings for each source. Switch between TV audio, Blu-Ray, media players and more–and the AVR-S940H adjusts the EQ settings to your preferences for that media source. Use the buttons on the front panel or opt for the same Quick Selects on the AVR remote for faster control.